Bring the tropics into your home, office, or lobby with this stunning tropical arrangement. 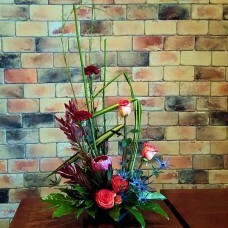 The exotic leafy texture combined with the elegance of fresh flowers will wow anyone who sees it. The angles of the hala leaf and other tropical greenery with a spattering of roses, carnations, and protea give this tropical arrangement a fun and full look. Explore the depths of the jungle in the comforts of your home or office with this fresh flower arrangement! Invest in the best to make this fresh flower arrangement even more special in both value and fullness of flowers! To make this fresh flower arrangement a gift, add an irresistible box of chocolates! Substitutions may be needed according to season and stock. We will still capture the magic!